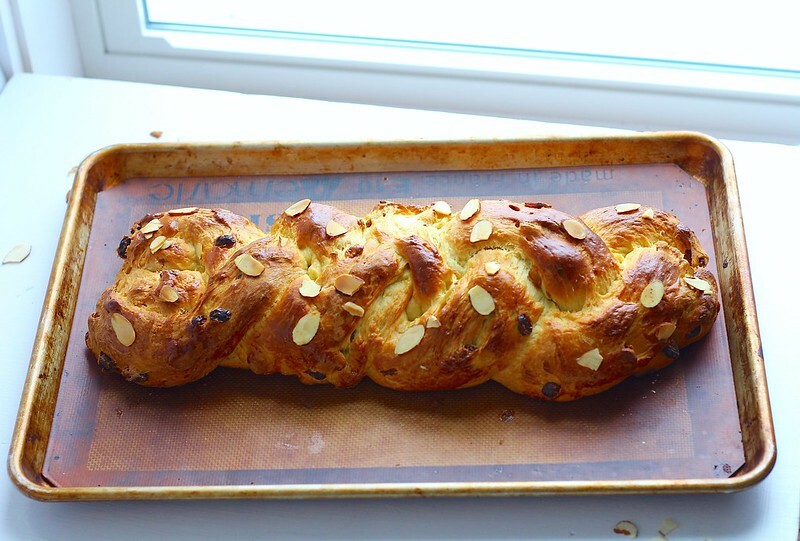 For one last dish before Easter, I thought I would share this awesome bread with you. I kind of see Easter as one of the last holidays to showcase bread before summer comes and everything turns to salads and grilling. And ice cream, because we can't forget that! 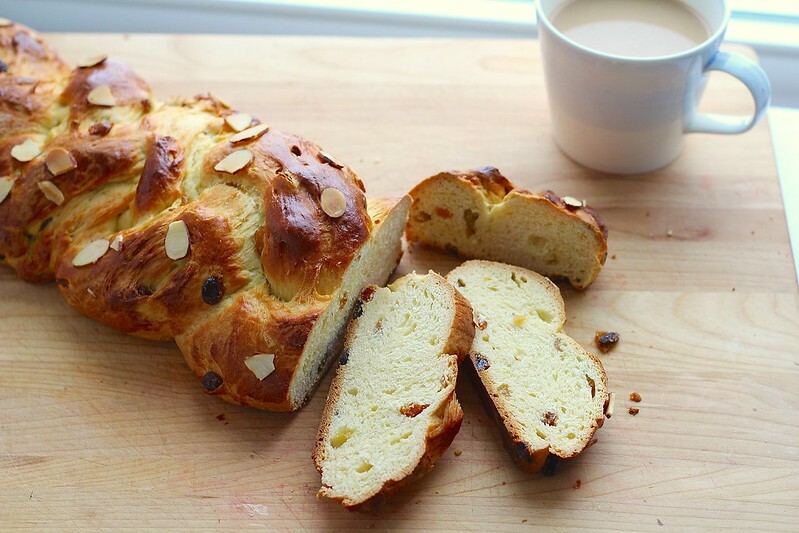 This bread has golden raisins soaked in amaretto, and shredded marzipan scattered throughout the loaves. To me, that alone, is enough reason to make the bread in itself. Once you add some butter, a little heavy cream, sliced almonds and orange zest, I am running to the kitchen. And you should be as well. 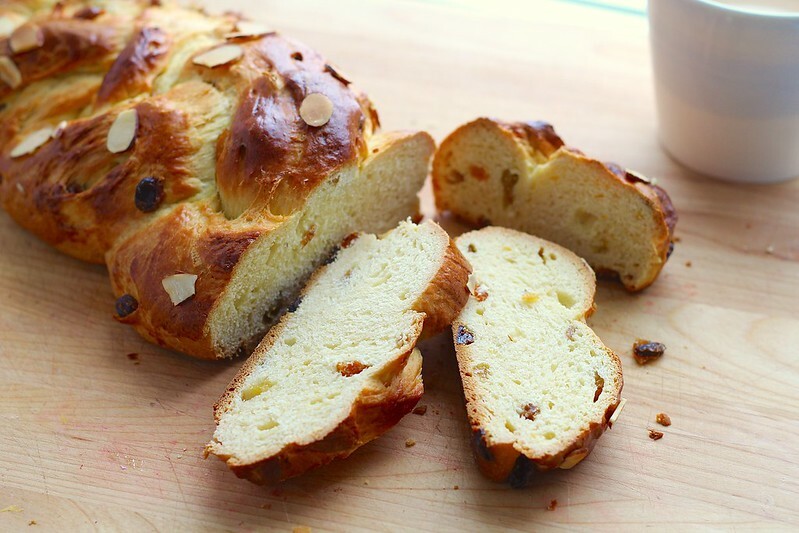 This recipes makes a generous two loaves, so perfect for freezing one, or feeding a large crowd this weekend! Don't let the long list of ingredients or instructions intimidate you, because it really comes together quite quickly. Get your hands dirty and your bread on this weekend! Wrap the marzipan in plastic wrap and place in the freezer. Freeze until solid, about 2-3 hours. Grate on the side with the large wholes of a box grater. Set aside. In a small saucepan, bring the amaretto and water to a boil over medium-high heat. Stir in the raisins, then remove from the heat. Let stand for 30 minutes. Strain the raisins, discarding the excess liquid. Set aside. In the bowl of a stand mixer fitted with the paddle attachment, combine the warmed milk and yeast. Let stand until foamy, about 5 minutes. Stir in the heavy cream and orange juice. Turn the mixer on to medium speed and beat in the sugar, salt, orange zest, eggs, egg yolks and almond extract. Beat until combined. Turn the mixer down to low speed and gradually beat in 4 1/2 cups flour. Switch to the dough hook, then, mix in the butter, 1 tablespoon at a time, until completely combined. Stir in the raisins and shredded marzipan. With the mixer on medium-low speed, stir in 3 more cups of flour. (If this is too much flour for your mixer to handle, transfer the dough to a large bowl and stir in by hand). Knead on medium speed, until smooth and elastic, about 6 minutes. If the dough is sticking to the bowl, or still sticky to the touch, add more flour, 1 tablespoon at a time, until the right consistency is reached. Transfer the dough to a lightly floured surface and knead by hand for 1 minute. Shape into a ball, and place in a large greased bowl, turning once to coat. Cover with plastic wrap and let rise in a warm spot for about 2 hours, or until doubled in size. Once the dough has risen, lightly punch down and transfer to a lightly floured work surface. Dived in half and cover with a clean dish towel. Let rest for 5 minutes. Meanwhile, line two baking sheets with parchment paper or a rubber baking mat. Take one half of the dough and divide into 4 equal size pieces. Roll each piece into a rope that is about 15 inches long. Line the pieces next to each other, vertically. Connect all 4 "ropes" at the top by pinching together. To braid, cross the 4th strand over the 2nd strand, then the 1st strand over the 3rd strand, and the 2nd strand over the 3rd strand. Repeat pattern until you've reached the end. Pinch the ends together and place on the prepared baking sheets. Repeat process with remaining half of dough. Cover the loaves with lightly draped plastic wrap and let rise for 30 minutes. Meanwhile, preheat the oven to 350ºF. Once the dough has risen, beat the egg and milk together to make an egg wash. Brush the wash over the loaves and sprinkle with almonds. Place in the preheated oven and bake for 45-50 minutes, or until a thermometer inserted in the center reads 190ºF. If the loaves are browning too quickly, loosely cover with tin foil. Remove from oven and let cool for 10 minutes, before transferring to a cooling rack. Let cool completely before slicing and serving.